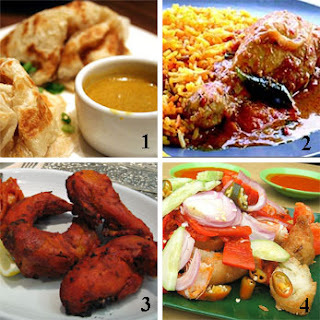 The Indian food in Malaysia are often of hot and spicy flavors, the Indians’ staple diet usually consists of either rice or bread (charpatti, parrata, puri). They eat this with various curries. As in accordance with their Hindu beliefs, they do not eat beef. Usually Indian food is sold at the various local stalls and often ordered with a glass of teh tarik. Teh Tarik literally means “pulled tea”. The tea is thick and frothy. The preparation involves passing the tea and milk from one big metal mug to the other with a “pour and pull” action. Indian Pastry Pancake – this is a very special layered pan cake made with flour and water. The fresh dough is kneaded and tossed in the air then folded into layers and cooked on a very hot iron plate. A side of curry is served for dipping the flaky pancake, usually a Malaysian Chicken Curry. The Roti Canai is the most commonly seen Indian food in Malaysia. This is a very traditional Indian food where the rice is cooked in goat butter and spices, Nasi biryani refers to the rice only cooked without the meat, and is a choice of to eat with your selection of curries and side dishes. The dish is assembled by layering the flavorful rice with tender pieces of spiced-cooked lamb, mutton or chicken, with a garnishing of slivered almonds and raisins. Tandoori chicken can be found in all Mamaks (local Indian restaurants). Mildly-spiced spring chicken quarters are baked to tender succulence in a tandoor – a traditional Indian clay oven. A spicy mint sauce is usually served on the side with plain or garlic Naan bread. The finger licking delicious indian food! My favourite Indian food – In Malaysia, Indian rojak contains fried dough fritters, boiled potatoes, prawn fritters, hard boiled eggs, bean sprouts and cucumber mixed with a thick, spicy peanut sauce. Please inform me 5 star hotel with Indian food restarent.